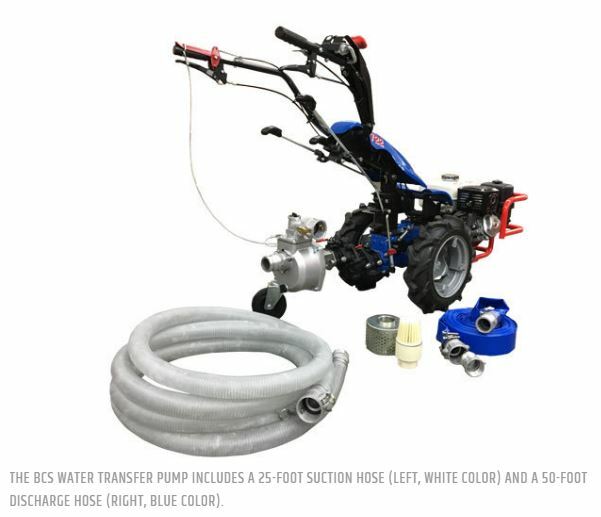 NOTE: The Water Transfer Pump requires the Power Cradle accessory to multiply the PTO speed. 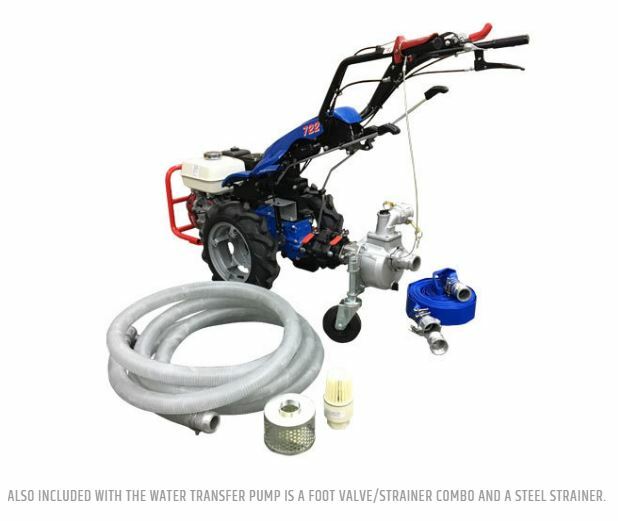 The BCS Water Transfer Pump attachment delivers more value to your BCS tractor! This self-propelled pump can be used for several applications on your property. With a maximum of 50 PSI and 147 GPM, the pump is fully capable of handling lawn and garden watering, flood water removal, and pond/pool filling. The Water Pump is compatible with all BCS tractor models (710 and up). 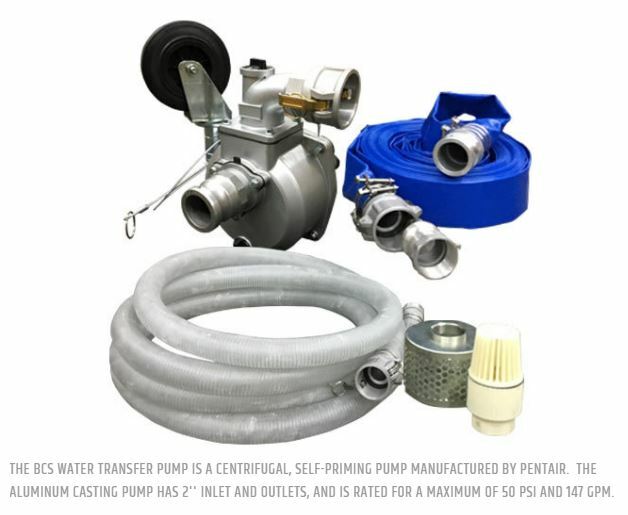 The Hypro centrifugal pump is manufactured by Pentair and features an aluminum casting with 2’’ inlet and outlets. 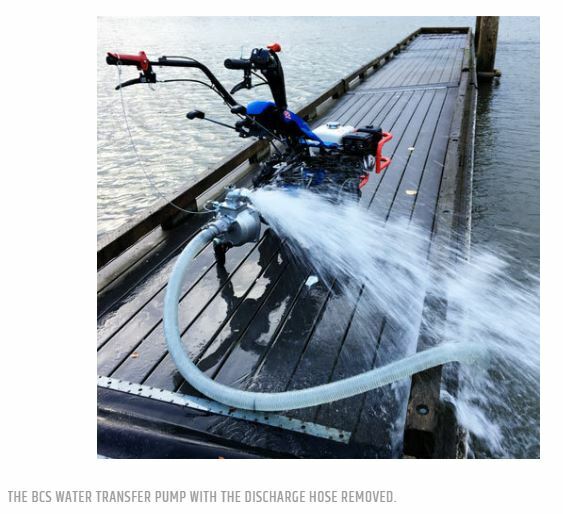 The pump is “self-priming,” which utilizes air and water to reach a fully-primed pumping condition. Only the chamber needs to be filled with liquid prior to operation. The attachment includes 2’’ suction and discharge hoses, which are 25’ and 50’ long, respectively. Both hoses have aluminum camlock fittings, and one extra camlock fitting is included with the discharge hose. The pump is also fitted with a caster wheel for easy maneuverability. Using ponds, creeks, or wells as water sources, the Water Transfer Pump is a good fit for flood or sprinkler irrigation. For drip irrigation, a 120-micron filter, regulator, and pressure relief valve is recommended. 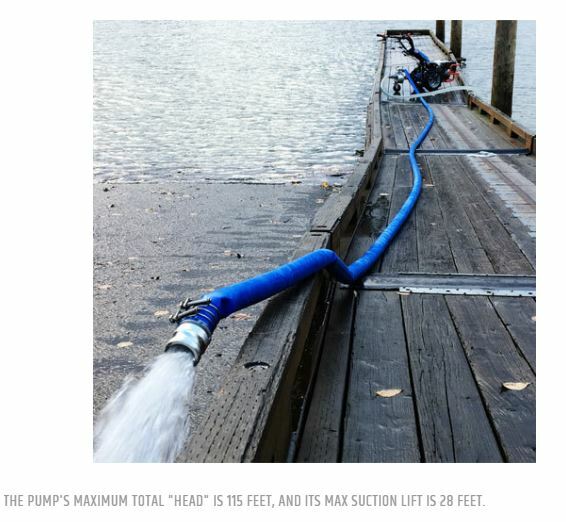 The Water Transfer Pump has a maximum “head” of 115 feet. This refers to the total height from the source of the water to the destination or discharge point. The unit also has a maximum vertical suction lift of 28 feet, which is the vertical distance from the water source to the pump. This is important for draining a basement or deep pond. 25′ suction and 50′ discharge hoses included. Foot valve/strainer combo and steel strainer included. Caster wheel for easy maneuverability. Maximum vertical suction of 28 feet. Maximum total head of 115 feet.